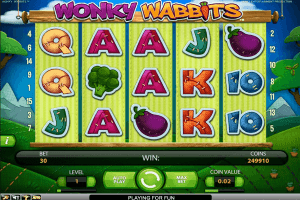 Wonky Wabbits is a Net Entertainment powered slot game that is operated by OddsMatrix Limited. The game has a natural them to it, as players will quickly notice the green fields that are located behind the reels with the open cloudy skies. As for the visuals of the symbols that appear on the reels, they are equally outstanding and they include plenty of vegetables such as carrots, broccoli, tomatoes and corn. 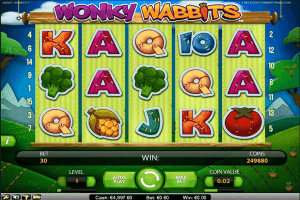 There are also poker card symbols that come in cute and colorful designs, these card symbols represent the lower paying symbols of the Wonky Wabbits video slot machine. The game has a total of five smooth reels that have a total of 30 winning lines spread across them. 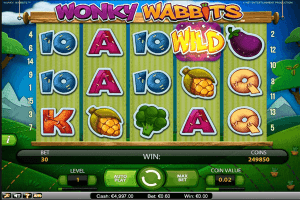 Players can place their wanted bets on these lines and reels under the reel as they go through the betting options that the slot game has. 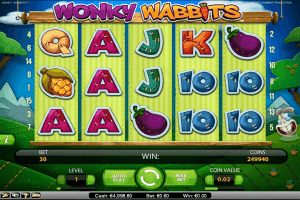 The first one is the betting level as players will find 10 betting levels that they can pick from, and the other betting option is the value of the coins that players wish to use to place the bets. The values of these used coins vary between 0.01 and 0.50 credits per coin. This results in the creation of a betting range that starts at 0.30 and 150 credits per spin. The game has one special symbol which is the wild icon. Being wild enables the symbol to replace any of the other icons of the game in order to form a better paying combo so players can earn great awards. Only one payout is given when a wild appears, and it is the highest payout possible. That is not all, as the game comes with the highly rewarding Wild Duplication feature. This feature is activated when players get a wild icon anywhere on the reels. When that happens, the wild symbols will duplicate itself and will appear in another location on the reels that would give players the highest payout possible by creating the highest paying combo of symbols. Wild symbols can also appear stacked on the 2nd reels and the 4th reel. This means that up to 14 wild symbols can land on the reels to help players get paid during the Wild Duplication feature.